Arthur "Art" Blakey (October 11, 1919 – October 16, 1990), (also known as Abdullah Ibn Buhaina) was an American jazz drummer and bandleader. Blakey made a name for himself in the 1940s in the big bands of Fletcher Henderson and Billy Eckstine. He worked with bebop musicians Thelonious Monk, Charlie Parker and Dizzy Gillespie. In the mid-1950s Horace Silver and Blakey formed the Jazz Messengers, a group that the drummer was associated with for the next 35 years. The Messengers were formed as a collective of contemporaries, but over the years the band became known as an incubator for young talent, including Freddie Hubbard, Wayne Shorter and Wynton Marsalis. The Biographical Encyclopedia of Jazz calls the Jazz Messengers "the archetypal hard-bop group of the late '50s". A relentless performer, Blakey continued to record as a sideman throughout his career—frequently for Messengers alumni. He also led several percussion-centric albums with many of his peers. Blakey was inducted into the Down Beat Jazz Hall of Fame (in 1981), the Grammy Hall of Fame (in 1998 and 2001), and was awarded the Grammy Lifetime Achievement Award in 2005. ^ a b c d e f g h Feather, Leonard; Gitler, Ira (1999). The Biographical Encyclopedia of Jazz. Oxford University Press, USA. p. 65. ^ a b c d e f g h i j k Gourse, Leslie (2002). Art Blakey. Music Sales Group. ^ a b c d e "Art Blakey Biography". Bio. Retrieved 16 September 2014. ^ a b c d e f Goldsher, Alan (2008). Hard bop academy : the sidemen of Art Blakey and the Jazz Messengers (1st ed. ed.). Milwaukee, Wis.: Hal Leonard. pp. 2–5. ^ a b c d "Art Blakey". National Endowment for the Arts. Retrieved 16 September 2014. ^ a b c d e "Art Blakey". PBS. Retrieved 16 September 2014. ^ a b c d Watrous, Peter (October 17, 1990). 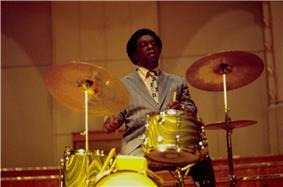 "Art Blakey, Jazz Great, Is Dead; A Drummer and Band Leader, 71". The New York Times. ^ a b "Blakey, Arthur (Art; Buhaina, Abdullay Ibn; Bu)". . Retrieved 16 September 2014. ^ a b c Miller, Yawu (1994). "Art Blakey". In Ramsay, John. Art Blakey's jazz messages. Miami, Fl. : Manhattan Music Publications. ^ a b c d e f Kelsey, Chris. "Art Blakey". All Music. Retrieved 16 September 2014. ^ "Art Blakey". All About Jazz. Retrieved 16 September 2014. ^ "Blakey, Art (Arthur)". jazz.com. Retrieved 16 September 2014. ^ Taylor, Arthur. Note and Tones: Musician-to-musician Interviews. Da Capo Press. ^ "Art Blakey". Encyclopaedia Britannica. Retrieved 16 September 2014. ^ Art Blakey (1957). Ritual:The Jazz Messengers featuring Art Blakey (LP) (record). Pacific Jazz. track B1. ^ a b c d "Art Blakey Discography". JazzDisco.org. Retrieved 17 September 2014. ^ a b c d e f g Brandi Denison, 2010, "Blakey, Art (Ibn Buhaina Abdullah)", in Encyclopedia of Muslim-American History (Edward E. Curtis, Ed. ), pp. 85f (New York: Infobase Publishing). ISBN, 1438130406. Available at: http://books.google.com/books?id=owZCMZpYamMC Accessed Apr 23, 2014. ^ "Monk's Music". Monkzone.com. June 26, 1957. Retrieved 2011-10-06. ^ a b Feather, Leonard (1955). ^ "Art Blakey". DrummerWorld. Retrieved 16 September 2014. ^ Schwartz, Steve; Fitzgerald, Michael. "Chronology of Art Blakey (and the Jazz Messengers)". www.JazzDiscography.com. Retrieved 16 September 2014. ^ See, for instance: "Art Blakey solo", available at: http://www.youtube.com/watch?v=VkjRoTh0ktU Accessed Apr 23, 2014. ^ From The New Grove Dictionary of Jazz, via the PBS web resources for the Burns' documentary: PBS.com website [Internet], 2014, "Art Blakey". Available at: http://www.pbs.org/jazz/biography/artist_id_blakey_art.htm Accessed 22 Apr 2014. ^ "Art Blakey, Jazz Great, Is Dead; A Drummer and Band Leader, 71". New York Times article by Peter Watrous. October 17, 1990. Retrieved April 25, 2010. ^ "Miles Davis III Discography". Miles Davis' biography by Scott Yanow of Allmusic. ^ a b c d e f g John Cohassey [Internet], 2014, "My Friend Art Blakey: Recollections of a Jazz Fan from Detroit, by Jerry "Tiger" Pearson, as told to John Cohassey" (Supporting material for America's Cultural Rebels: Avant-Garde and Bohemian Artists, Writers and Musicians from the 1850s through the 1960s by Roy Kotynek and John Cohassey (Jefferson, NC:McFarland & Company), ISBN 978-0-7864-3709-2. Available at: www.americanavantgarde.com/blakeyinterview.htm. Accessed Apr 22, 2014. ^ a b Regina Schaffer, 2014, "Art Blakey will be remembered by Keith Hollis band, Jazz Vespers in Atlantic City Sunday", Atlantic City Insiders, January 14, 2014. 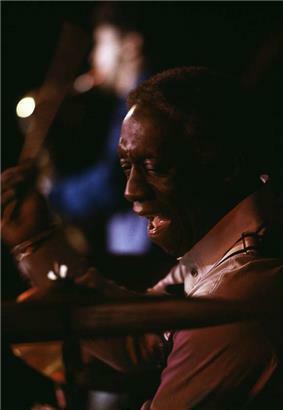 Available at: http://www.atlanticcityinsiders.com/headliners/art-blakey-will-be-remembered-by-keith-hollis-band-jazz/article_5f4f75ec-7d64-11e3-a578-001a4bcf887a.html Accessed Apr 22, 2014. ^ Jeff Schwachter, 2010, "Art Blakey Topic of New Book by Atlantic City Author", Atlantic City Insiders, November 17, 2010. 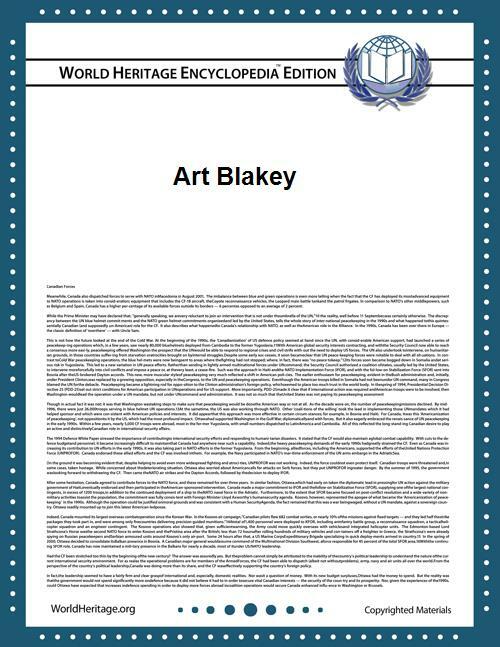 Available at: http://www.atlanticcityweekly.com/news-and-views/local-history/Art-Blakey-the-Topic-of-a-New-Book-by-Atlantic-City-Author-108738354.html Accessed Apr 22, 2014. 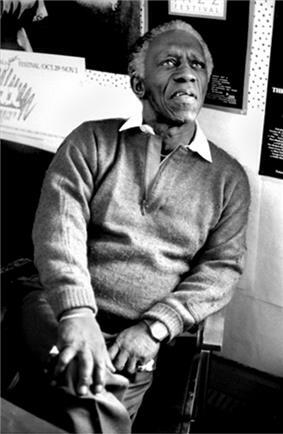 ^ Jeff Schwachter, 2005, "Remembering the Messenger: Jazz legend Art Blakey and his small town Atlantic County digs", Atlantic City Insiders, October 27, 2005. Available at: http://www.atlanticcityweekly.com/arts-and-entertainment/features/remembering_the_messenger-50669227.html?page=1&comments=1&showAll= Accessed Apr 22, 2014. ^ John Moultrie, 2013, "Gary Bartz Talks About Drug Use Among Jazz Greats", 2013 Jazz Festival (iRock Jazz Team, irockjazz.com). Available at: http://www.youtube.com/watch?v=8KL1pbN9Gj0 Accessed Apr 22, 2014. ^ LondonJazzCollector [Internet], 2011, "Art Blakey "Buhaina's Delight" (1961)", Available at: http://londonjazzcollector.wordpress.com/2011/09/18/4104-art-blakey-buhainas-delight-1961/ Accessed Apr 22, 2014. ^ See: "Art Blakey & Ginger Baker Drum Duo", available at: http://www.youtube.com/watch?v=qghrsBfSbgk Accessed Apr 23, 2014. ^ Internet Movie Database (imdb) [Internet], 2014, "Beware of Mr. Baker (2012)", Available at: http://www.imdb.com/title/tt1931388/ See also: http://bewareofmrbaker.com Accessed Apr 23, 2014. ^ "Downbeat Hall of Fame". DownBeat. Retrieved 17 September 2014. ^ "Grammy Award Winners 1984". Grammy.com. Retrieved 17 September 2014. ^ a b "Grammy Hall of Fame". Retrieved 17 September 2014. ^ "Grammy Lifetime Achievement Award". Grammy Lifetime Achievement Award. Retrieved 17 September 2014. Blakey had been living in Manhattan (New York City), when he died of lung cancer at age 71, at St. Vincent's Hospital and Medical Center. Blakey's New York Times obituary notes that he was survived by four daughters (Gwendolyn, Evelyn, Jackie, and Sakeena, and by four sons (Takashi, Kenji, Gamal, and Akira. As John Cohassey reports, Blakey was a "jazz musician who lived most of his life on the road, [and] lived by the rules of the road." This lifestyle resulted in run-ins related to but predating the civil rights era (including a 1939 Fletcher Henderson band episode in Albany, Georgia, where an altercation and Blakey's treatment after arrest led to surgery inserting a plate in his head). Drummer Keith Hollis, reflecting on Blakey's early life, states his perception that his fellow drummer "wound up doing drugs to cope"; like many of the era, Blakey and his bands were known for their drug use around travel and performing (with varying accounts of Blakey's influence on others in this regard). Other specific recollections have Blakely forswearing serious drink while playing (after being disciplined by drummer Sid Catlett early in his career, for drinking while performing), and suggest that the influence of "clean-living cat" Wynton Marsalis led to a period where drugs were a less serious matter during performances. Blakey was also a heavy smoker; he appears in a cloud of smoke on the Buhaina's Delight (1961) album cover, and, similarly, in extended footage of a 1973 appearance with Ginger Baker, Blakey begins a long drummers "duel" with cigarette alight. Blakey traveled for a year in West Africa (1948) to explore the culture and religion of Islam he would adopt alongside changing his name (see above); Art's conversion to "Bu" took place in the late 1940s at a time when other African-Americans were being influenced by the Ahmadi missionary Kahili Ahmed Nasir, according to the Encyclopedia of Muslim-American History, and at one time in that period, Blakey led a turbaned, Qur'an-reading jazz band called the 17 Messengers (perhaps all Muslim, reflecting notions of the Prophet's and music's roles as conduits of the divine message). A friend recollects that when "Art took up the religion [...] he did so on his own terms. ", saying that "Muslim imams would come over to his place, and they would pray and talk, then a few hours later [we] would go [...] to a restaurant [...and] have a drink and order some ribs", and suggests that reasons for the name change included the pragmatic: that "like many other black jazz musicians who adopted Muslim names", musicians did so to allow them to "check into hotels and enter 'white only places' under the assumption they were not African-American". Blakey reportedly stopped public practice of Islam in the 1950s (though retaining his name and continuing private Qur'anic prayer), perhaps because of the pressures of touring and performing, perhaps in response to experiencing racism within the adoptive religion he believed free from this perceived Christian practice. In addition to his musical interests, Blakey was described by Jerry "Tiger" Pearson as a storyteller, as having a "big appetite for music [...] women [and] food", and an interest in boxing. Blakey married four times, and had common law and other relationships throughout his life. He married his first wife, Clarice Stewart, while yet a teen, then Diana Bates (1956), Atsuko Nakamura (1968), and Anne Arnold (1983). These relationships gave him 10 children—daughters Gwendolyn, Akira, Evelyn, Jackie, Kadijah, and Sakeena, and sons Art Jr., Takashi, Kenji and Gamal. Sandy Warren, another longtime companion of Blakey, published a book of reminiscences and favorite food recipes from the period of the late 1970s to early 1980s when Blakey lived in Northfield, New Jersey with Warren and son Takashi. Blakey's and his bands' legacy is not only for the music they produced, but also in their role as a proving ground for several generations of jazz musicians. Observers have stated the opinion that Blakey's groups' productivity and influence are matched only by those of Miles Davis. Blakey was inducted into the Jazz Hall of Fame (in 1982), the Grammy Hall of Fame (in 2001), and was awarded the Grammy Lifetime Achievement Award in 2005. Blakey's final performances were in July 1990. He died merely months later, on October 16 of the same year. Blakey went on to record dozens of albums with a constantly changing group of Jazz Messengers. He had a policy of encouraging young musicians: as he remarked on-mike during the live session which resulted in the A Night at Birdland albums in 1954: "I'm gonna stay with the youngsters. When these get too old I'll get some younger ones. Keeps the mind active." After weathering the fusion era in the 1970s with some difficulty (recordings from this period are less plentiful and include attempts to incorporate instruments like electric piano), Blakey's band got revitalized in the early 1980s with the advent of neotraditionalist jazz. Wynton Marsalis was for a time the band's trumpeter and musical director, and even after Marsalis's departure Blakey's band continued as a proving ground for many "Young Lions" like Johnny O'Neal, Philip Harper, Terence Blanchard, Donald Harrison and Kenny Garrett. Blakey continued performing and touring with the group into the late 1980s; Ron Wynn notes that Blakey had "played with such force and fury that he eventually lost much of his hearing, and at the end of his life, often played strictly by instinct." Many Messenger alumni(ae) went on to become jazz stars in their own right, such as: Benny Golson, Wayne Shorter, Freddie Hubbard, Bobby Timmons, Curtis Fuller, Chuck Mangione, Keith Jarrett, Joanne Brackeen, Woody Shaw, Wynton Marsalis, Branford Marsalis, Terence Blanchard, Donald Harrison and Mulgrew Miller. For a complete list of Art Blakey and the Jazz Messenger alumni, some of whom did not actually record with the band, see main article The Jazz Messengers. From 1959 to 1961 the group featured Freddie Hubbard and Cedar Walton, respectively. The group evolved into a proving ground for young jazz talent. While veterans occasionally re-appeared in the group, by and large, each iteration of the Messengers included a lineup of new young players. Having the Messengers on your resume was a right of passage in the jazz world, and conveyed immediate bona fides. The "Jazz Messengers" name was first used for this group on a 1954 recording nominally led by Silver, with Blakey, Mobley, Dorham and Doug Watkins – the same quintet recorded The Jazz Messengers at the Cafe Bohemia the following year, still functioning as a collective. Donald Byrd replaced Dorham, and the group recorded an album called simply The Jazz Messengers for Columbia Records in 1956. Blakey took over the group name when Silver left after the band's first year (taking Mobley and Watkins with him to form a new quintet), and the band name evolved to include Blakey's name, eventually settling upon "Art Blakey and the Jazz Messengers." Blakey led the group for the rest of his life. Around the same time—in 1947 or 1949:20—Blakey led a big band called Seventeen Messengers. The band proved be financially unstable and broke up soon after. :20 The use of the Messengers tag finally stuck with the group co-led at first by both Blakey and pianist Horace Silver, though the name was not used on the earliest of their recordings. On December 17, 1947 Blakey led a group known as "Art Blakey's Messengers" in his first recording session as a leader, for Blue Note Records. The records were released as 78's at the time and two of the songs were released on the "New Sounds" 10" LP compilation (BLP 5010). This octet included Kenny Dorham, Howard Bowe, Sahib Shihab, Musa Kaleem, Ernest Thompson, Walter Bishop, Jr., and LaVerne Barker. By the late forties and early fifties, Blakey was backing musicians such as Davis, Parker, Gillespie, Bud Powell and Thelonious Monk; he is often considered to have been Monk's most empathetic drummer, and he played on both Monk's first recording session as a leader (for Blue Note Records in 1947) and his final one (in London in 1971), as well as many in between. After the Eckstine band broke up, Blakey states that he travelled to Africa for a time: "In 1947, after the Eckstine band broke up, we -- took a trip to Africa. I was supposed to stay there three months and I stayed two years because I wanted to live among the people and find out just how they lived and -- about the drums especially." Two years is an exaggeration, as Blakey is known to have recorded in 1947, 1948 and 1949. 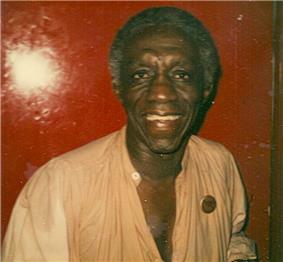 Blakey did study and convert to Islam during this period, taking the name Abdullah Ibn Buhaina (subsequent nickname, "Bu"), although he stopped being a practicing Muslim in the 1950s (see "Personal life", in following) and continued to perform under the name "Art Blakey" throughout his career. From 1943 to 1947 Blakey worked with Billy Eckstine's big band. Through this band, Blakey became associated with the bebop movement, along with his fellow band members Miles Davis, Dexter Gordon, Fats Navarro, Dizzy Gillespie, Charlie Parker and Sarah Vaughan among others. :11–12 He then lead his own band at the Tic Toc Club in Boston for a short time. :11 the injuries from which kept him out of World War II.